The constellation of Taurus is found on both sides of the elliptical orbit of the Sun, thus making it one of the 12 astrological signs of the Zodiac. This constellation is seen in the winter sky, especially around December and January, and is remarkably easy to observe, due to the pronounced nature of many of its beautiful stars. 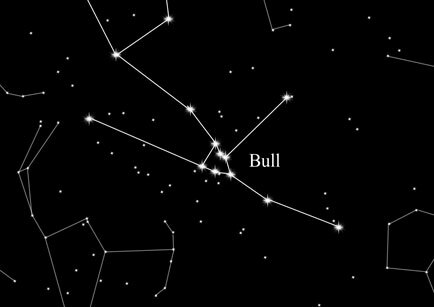 Taurus appears in the sky, in the shape of a bull and can be found northeast of the prominent Orion Nebula. Amongst its most noticeable features are the "v" shaped formations of stars known as the Hyades, which make up the bulls head. The eye of the bull is demarcated by the reddish glow of the Star Aldebaran. The peak of the bull’s horn is represented by the star Elnath, the second brightest star of the bull constellation, which is located in an easterly direction from Hyades. Finally, the relatively young group of stars known as the Pleiades is located near Elnath. In Greek mythology, the King of the Gods Zeus was besotted by the beautiful Europa. Zeus decided he wanted to seduce Europa, so he poised as a large white bull. While Europa was picking flowers, she came across this impressive bull and sat on his back and started to caress it. She became so preoccupied by this activity that she did not notice him moving. They swam away, finally arriving on the Island of Crete. Once they arrived on Crete, Zeus revealed himself to be the God Zeus, whereupon he made Europa the Queen of Crete. In commemoration of his transformation into a bull, Zeus created Taurus the constellation of the Bull. Astrological significance: Taureans are ruled by the element of the Earth, which makes them practical people. Taureans, like Zeus the King of the Gods, are strongly passionate and romantic in character. Happiness for Taureans comes in time, by patiently building up a successful life for themselves and their families.